SAN FRANCISCO — Tesla Inc. temporarily suspended production of the Model 3 electric sedan at its lone auto plant for a week in late February, a planned breather that ultimately may help increase output of the closely watched vehicle. Model 3 production was idled from Feb. 20-24 before resuming at the company's assembly plant in Fremont, Calif., Tesla confirmed Sunday. The automaker currently makes the Model S sedan, Model X crossover and Model 3 at that site, and batteries at a plant known as the Gigafactory east of Reno, Nev.
"Our Model 3 production plan includes periods of planned downtime in both Fremont and Gigafactory 1," a Tesla spokesman said in an emailed statement. "These periods are used to improve automation and systematically address bottlenecks in order to increase production rates. This is not unusual and is in fact common in production ramps like this." The automaker says on its Canadian website that international deliveries of left-hand drive vehicles begin this year. It also encourages people to "reserve your Model 3 today for delivery in 12 to 18 months." 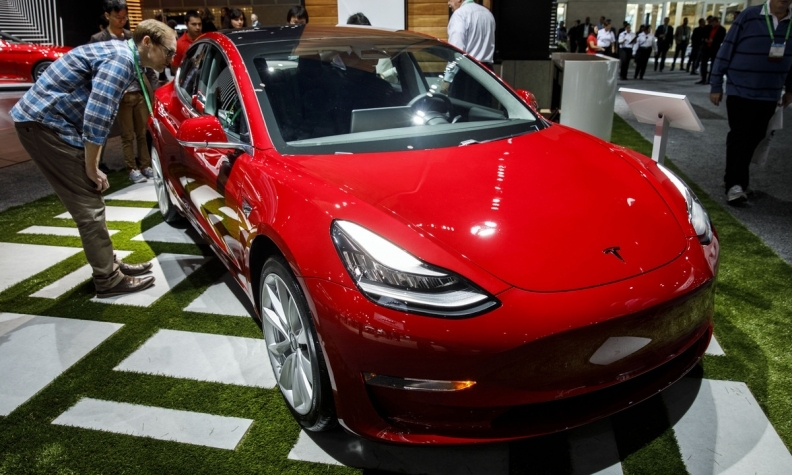 Tesla's Model 3 is the linchpin of CEO Elon Musk's plan to bring electric vehicles to the masses but ramping up production has taken longer, and been more challenging, than originally anticipated. Tesla is now targeting a weekly Model 3 production rate of 2,500 by the end of this month and 5,000 by the end of June. Musk, talking about his various businesses on stage Sunday at the SXSW entertainment festival in Austin, Texas, said, "People have told me that my timelines historically have been optimistic." In its last letter to shareholders, Tesla asked for patience as both buyers and investors wait for progress on deliveries, saying the Model 3 rollout has "demonstrated the difficulty of accurately forecasting specific production rates at specific points in time." Bloomberg has developed a tool to estimate Model 3 production. By late February, the Tesla Model 3 Tracker indicated that the weekly production rate had plunged. Bloomberg's model estimates production based on Vehicle Identification Numbers, or VINs, registered by Tesla with U.S. safety regulators and from customer VINs reported to Bloomberg. Both data sets began to show a rebound in production in early March.